Accuracy — The load element design and strain gauges chosen for the EDjunior produce an accuracy of 0.2 % (full scale). This level of precision offers flexibility for use in a broad range of applications. 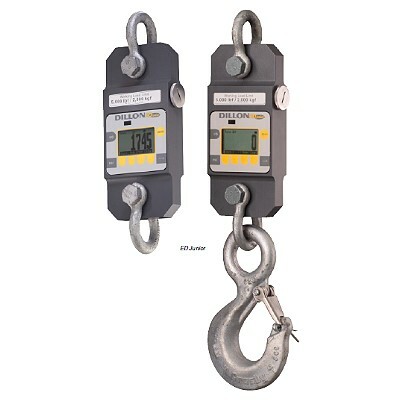 Capacities up to 10,000 lb (5000 kg) available. Resolution — Readings are displayed with a resolution of 1 part in 1000 to ensure the level of readability required for critical lifting applications. Control Interface – The exclusive Dillon SOFTKEY interface provides direct access to setup and display functions without the typical confusing menu structure. The 6-digit dot-matrix display features 1 inch (25 mm) high numerals for greater visibility. Heavy, cumbersome tools make tough jobs even harder. Through the use of aircraft quality materials, Dillon has made the EDjunior an easy-to-position, highly mobile instrument with exceptional strength. It offers an impressive factor of safety at all capacities. With its NEMA4/IP55 design, the EDjunior is at home in virtually any environment and ideally-suited to outdoor job-site applications as well as in-plant use.